I don’t prescribe to any particular religion, however, I can hardly argue with a holiday which dictates that you should eat pancakes. Mardi Gras, as far as I was concerned, was a massive party where you had all the fun you would be missing during Lent and ate all the goodies you’d be missing too. I had never heard any mention of pancakes in particular, but Pancake Day it is in Britain and who am I to disagree? First of all, let’s clarify that when I say pancakes I mean fluffy buttermilk delights smothered in maple syrup with a side of crispy, salty bacon – add as desired: eggs, hash browns, sausages, toast, etc. What the British tend to refer to as pancakes would be considered crêpes in the US. 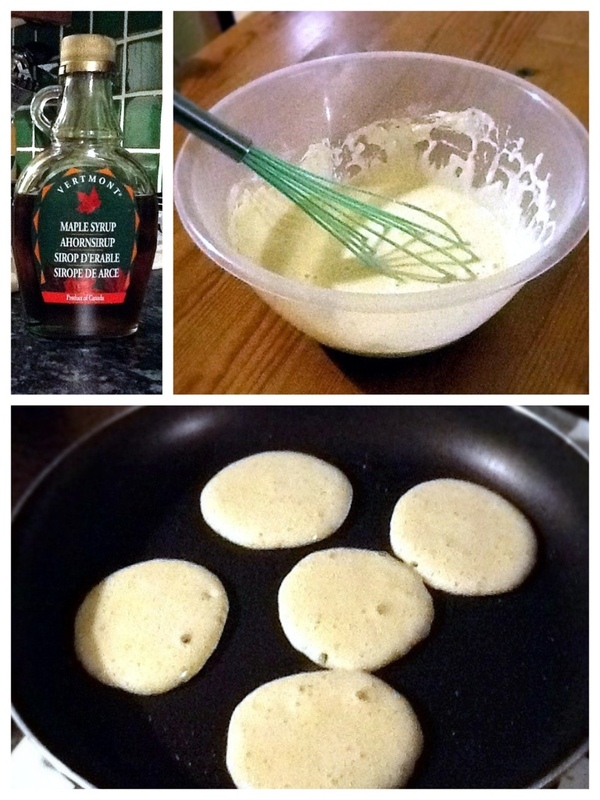 Thin, meager, flat cakes which are delicious, yes, but are typically vehicles of dessert rather than the hearty, American-style breakfast which will get your day started right – or put you into a carb and meat coma, either way. Like most Brits, my husband was dubious about the combination of salty and sweet which, for those of you who don’t know, is an American institution. Cue the peanut butter and jelly (or jam for those of you who wish to quibble) sandwich, a classic example of the magic that occurs when salty meets sweet. He couldn’t believe that bacon could be eaten alongside pancakes, let alone on the same forkful, and then I added maple syrup into the picture. His powers of reason were all but failing him. Surely this wouldn’t work, surely it was another sickly American concoction which would leave us, arteries clogged, blood sugar through the roof, unable to move from the sofa for the foreseeable future. Little did he know he would be fully converted. He’ll now happily eat ham, bacon or any matter of pork products with pancakes and syrup. Score one for the Americans. My recipe is simple: whisk one cup flour, one cup buttermilk (you can use regular milk, but it’s really not the same), one egg, one teaspoon baking soda, and a pinch of salt. Fry in a pan brushed with oil, you don’t want them swimming in oil, until golden brown on each side. 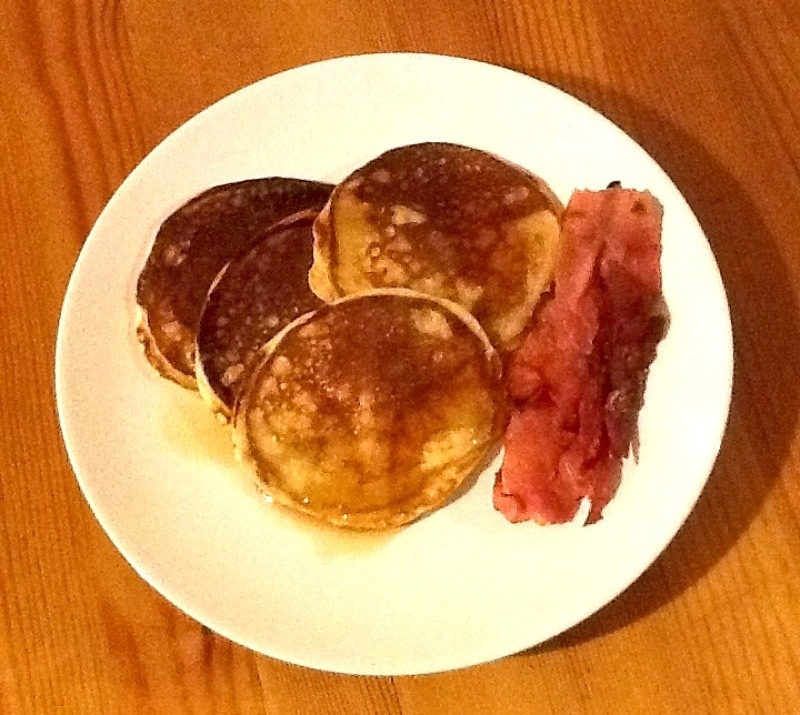 Enjoy with plenty of bacon, streaky if at all possible – this was a concession in tonight’s dinner for which I apologize, but sometimes marriage calls for compromise – butter and lots and lots of maple syrup.